The renowned philologist, English literature scholar, public figure and UNESCO expert, who dedicated 43 years of her life to one of Russia's largest libraries, has died in Israel following a long illness. After a long illness, 69-year-old Yekaterina Genieva, a renowned translator and philologist, "a tireless patron of literature" and "good and kind person," in the words of writer Alexander Kabakov, has died in Israel. Genieva's friend, and author of internationally acclaimed novel, The Life and Extraordinary Adventures of Soldier Ivan Chonkin, Vladimir Voinovich told RBTH: "Genieva was an unusually erudite and talented person. Furthermore, her activity was never limited to her work in the library system. She translated and published books by English authors and continuously organized literary events." 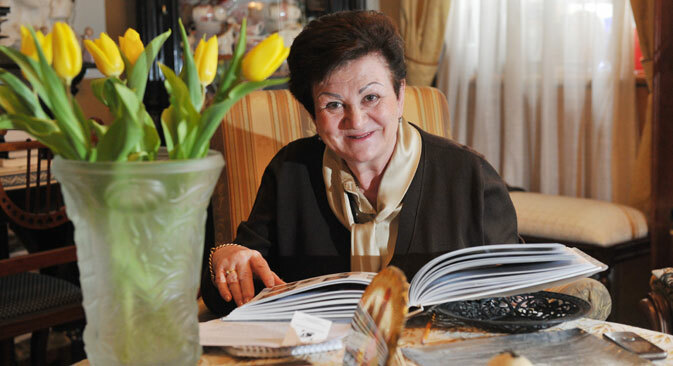 Genieva had incredible energy and charisma for everything: from managing the library, publishing and chairing Soros's Charity Foundation in Russia to raising monuments and participating in the Russian UNESCO committees and International Library Federation. In the middle of the 1980s Genieva was among the most ardent supporters of perestroika and other reforms initiated by Soviet leader Mikhail Gorbachev. She was a friend of Yegor Gaidar, finance minister and later prime minister under Russia's first president, Boris Yeltsin. She was near him when he fell ill, and after his death was one of those who took on his mantle. At that time she was very keen on English literature: She wrote articles, initiated translations and publications. She was known as "an unmatched Joyce scholar." That was when she began her intense activity as a librarian. Writer and editor-in-chief of one of Russia's oldest and most authoritative literary magazines Znamya Sergei Chuprinin said: "In the middle of the 1990s I came to Katya with a project that seemed completely insane - a dictionary-directory of contemporary Russian literature. It didn't have anything to do with my Znamya or her library activity. But she listened to me and then said, "What do you mean it has nothing to do with it? If not me, then who?" This phrase became the moral imperative in all her activities for the rest of her life." The mid 1980s was a very difficult time for Russia, a time of global, tumultuous change, Chuprinin noted. "Genieva became chairwoman of the workforce council at the library, an organization that would have been useless in other places, but not where she was. Soon this council, and not the library administration, started making important decisions," he added. "And when world-famous philologist Vyacheslav Ivanov was appointed library director, he immediately asked Genieva to be his deputy. And when George Soros arrived in Russia with his charity projects, who could he have turned to if not her? With Genieva as director of the Soros Foundation, it was only thanks to her ceaseless energy that Russia managed to preserve many of its historical, cultural and literary monuments. She took charge of everything and did everything with transparent honesty and dedication." It would be difficult to list all of Genieva's merits and awards, but it is obvious that her major vocation and pride was the M. I. Rudomino Library of Foreign Literature, known simply as "Inostranka" in Russian. She dedicated 43 years of her life to the institution, 22 of which she was its director (by the way she became the director thanks to the Orthodox priest and theologian Alexander Men). She was the initiator of many Russian translations of foreign authors. She was attentive to the library's collection and always increased it. Genieva was a loyal servant of Inostranka and, even in difficult times, managed to defend "her" library's position. This is why she can be considered the heiress to the library's founder, Margarita Rudomino, who established the library in 1922 and was able to preserve a big part of its collection and its forbidden books during the Soviet era. Today the library contains more than five million books in 144 foreign languages. In its cozy courtyard visitors are greeted by sculptures of people whose memory Genieva had immortalized, those whom she considered geniuses, whom she dreamt of seeing and meeting everyday, whom she would have liked the library's readers to meet: Abraham Lincoln, Pope John Paul II, Charles Dickens, James Joyce, Heinrich Heine and many others. John Tefft, the U.S. Ambassador in Moscow, made an official statement on July 10 on the U.S Embassy’s Facebook page about Genieva (ed. note. abridged quote): "On behalf of the U.S. Embassy and the people of the United States of America I express my condolences to Mrs. Genieva's family and friends … As the director of the All-Russia State Library of Foreign Literature she played a crucial role in opening of the American Center which became an unique partnership (Between the Russian Federation and the United States), which took place in 1993, a critical year for the Russian Federation." In the previous version of the article we made a mistake: Genieva wasn't the daughter of Orthodox priest and theologian Alexander Men. RBTH apologizes for the misinformation.